It’s waaay overdue time for the June caption contest: pick a quote with the month “June” in it, enter it in the comments, and winner gets their website perma-linked at the top of the rotating link list for the month of June. And because I’m such a tard for posting it so late, I’ll give you, oh, until the end of the week before I declare a winner. Except for that bamboo scaffolding up there in the corner. Plus the fact that all little Italian alleyways like the above are required (by law) to have a picturesque game of pickup soccer going at all times, perferably whilst being watched over by a fat but genial pizzaria owner. All Of That For ME? 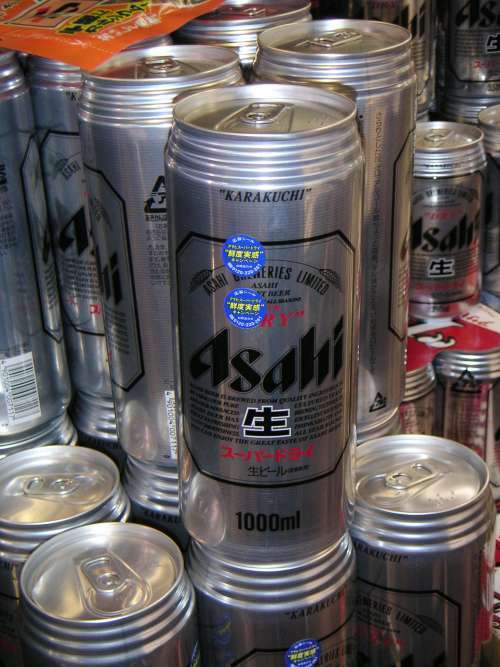 Yes, it’s a liter of beer IN A CAN (and since there are 14 cans visible in the picture, that adds up to about 3.7 gallons total). No, you can’t have any. Get your own. 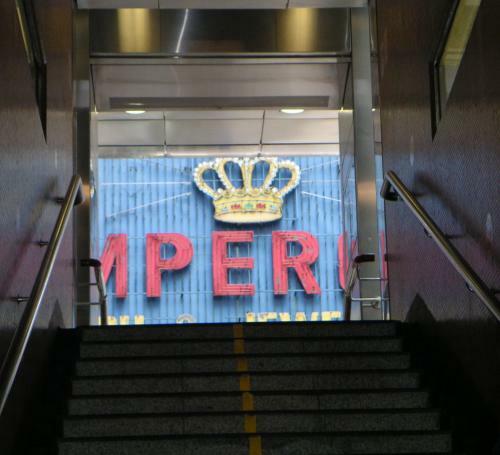 The Emperor Watch & Jewelry sign on Nathan Road. Dunno what’s up with the focus. Sorry about that. West Kowloon—most of what’s visable in this picture is reclaimed land; in other words, 10 years ago, that was mostly underwater. Oddly enough, the haze in Hong Kong is somewhat lessened during public holidays in China. Gee, I wonder why. 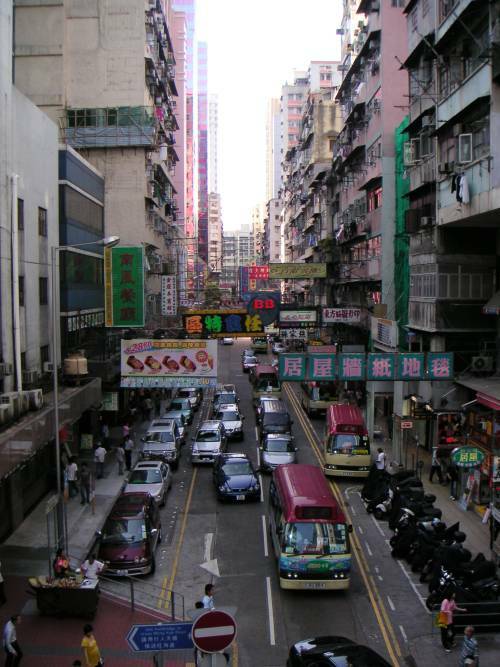 A few days ago, I mentioned that Mongkok is Hong Kong’s most densely packed neighborhood. Just how dense is it? Try roughly 165,000 people per square kilometer, or well over 400,000 people per square mile. By comparison, Manhattan (i.e. New York County) has a population density of a mere 67,000 people per square mile (the highest in North America). The big swoopy thing in the middle is a convention center, not a UFO. 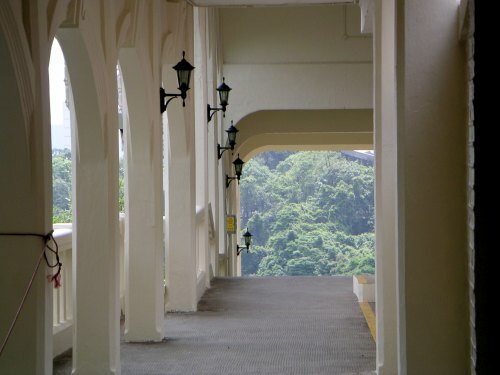 The Barker Road Peak Tram station. So peaceful, so serene, so un-used. Here’s a really neat video of Faraday waves in a slurry of cornstarch and water. The beginning of the video is weird enough—like something from an early Ridley Scott film—but the really freaky stuff comes at the end of video. Check it out. Flying Chair has a great picture of the new Olympic soccer stadium. 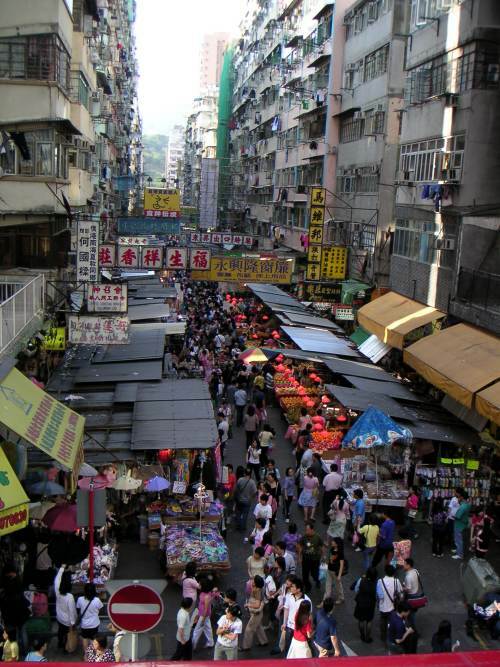 A street market in Mongkok, HK’s most densely populated neighborhood. The Chinese is just as inscrutable. 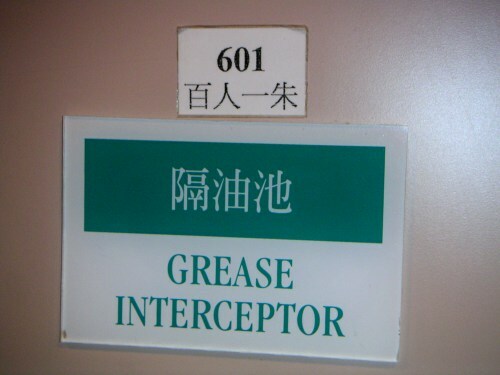 OK, so it’s probably just a funny name for a grease trap. 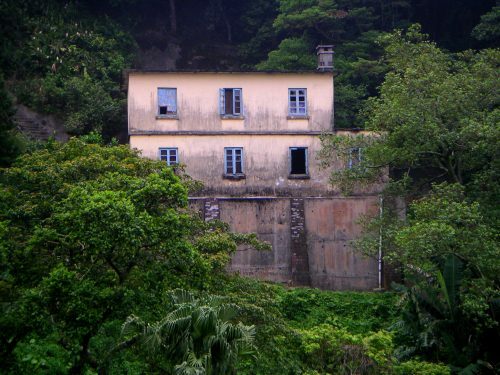 An old abandoned house, just a few feet from the Peak Tower. 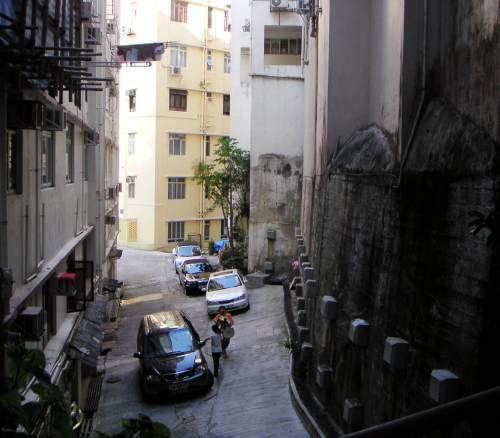 Note that this house, like most buildings on Hong Kong Island, is basically built on a cliff. 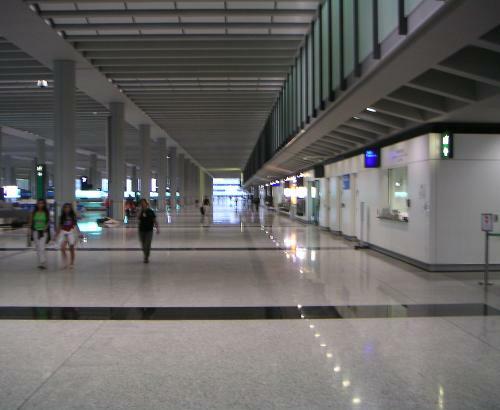 It is, after all, the baggage claim area at Chek Lap Kok*. This, er, recap-slash-parody actually makes me want to go out and see this movie. Not sure that was the intended effect. 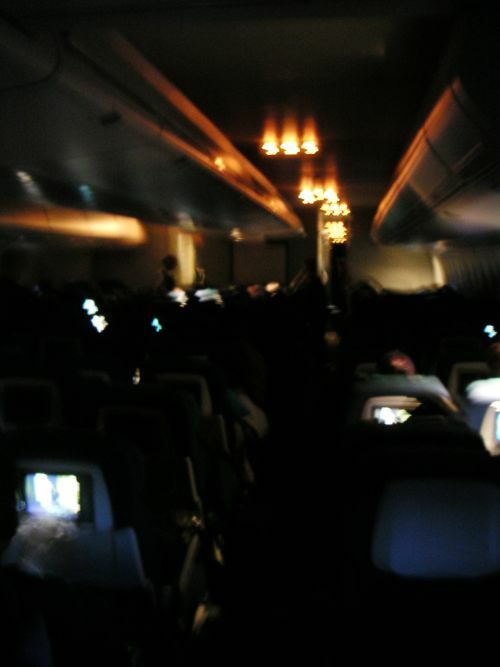 Continue reading 20 Hours Inside A 747. Good news: Yes, I can actually charge my Palm using only the USB cable. It only means leaving the computer on overnight. Bad news: now this means I have to figure out how to get my camera talking to this Win98 system…. Didn't Radiohead Write A Song About This Guy? The path of true love is never smooth. And in other news, I’m still here, still working my tail off, still not having enough free time. C’est la vie, eh? And while you’re over there visiting the Donk, don’t forget to check out his pithy tribute to the sonnet: How Much Does a Grecian Urn? *I’ve been informed by a reliable source that Tyrone Power and Maureen O’Hara are in talks to appear in the film version. Plus this guy in Beijing who was a grad student TA at UofA back when I was a lowly undergrad there. The name “Hong Kong” is a fairly bad transliteration of the Chinese name (it sounds a bit like “Heung Gong”), which means “Fragrant Harbor”. It was so-called because the island used to be dotted with sandalwood trees, which have a rather pleasant aroma. Naturally, there is nary a sandalwood tree left on the island. 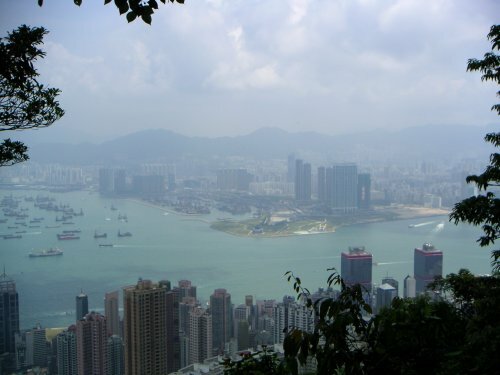 Back in the 70s and 80s, “Fragrant Harbor” referred to the stench rising from the pollution in the harbor; while clean-up efforts have improved the water quality significantly in recent years, government plans to continue to add landfill may eventually solve the water pollution problem permanently by simply eliminating the harbor altogether. Using with a laptop that’s running a Chinese version of Windows at work has not, unfortunately, improved my Chinese reading comprehension. It has, however, made me pretty good at guessing what menu item does what. The Cantonese are famous gourmands, even inside China. “They eat everything with four legs except the table” is one slightly admiring (if overblown) description of Cantonese cuisine, and the local chefs are happy to prove the maxim true (cats and dogs are not on the local menu, though they’re readily available in other parts of Asia). But aside from the outstanding native food, Hong Kong is a natural crossroads for food from all over China and Asia in general. The breadth and the quality of the cuisines on offer here is, quite frankly, staggering (one of the most memorable meals I’ve ever had—admittedly memorable more for the company than the food, though even now I can remember that lamb—was at a Lebanese restaurant in Hong Kong). Eating one’s way through the territory may be a short path to an early death, but o what a happy eternity it would be! So when a friend passed along a list of places to eat in Hong Kong from Gourmet, my curiosity was piqued. The first restaurant we tried from the list—called “The Water Margin”, named after a famous Chinese novel of bandits and derring-do—was, well, interesting. Walking into the dimly-lit restaurant (the only apparent sources of illumination are spots focused on the center of each table), you can only wonder if you, instead of entering a restaurant, accidentally wandered on an old Shaw Brothers movie set; sitting down, the sense that the peaceful (if dark) scene will be overrun by masked kung fu artists intent on mutual annihilation and the inevitable destruction of the restaurant is comically overpowering. The bowls and tea cups on the deliberately rough wooden table are artfully glazed to suggest extensive wear; the dark, rustic vestments of the staff suggest that they are disposable extras in the kung-fu extravaganza you are convinced is about to erupt. And when the check finally arrives after the meal, it arrives not on a mere tray but inside an elegantly carved box; the pen that is presented to sign the credit card slip with is made from rough-hewn wood. In short, it is a production (and that doesn’t even cover the waterfall at the entrance…). Unfortunately, the food falls somewhat short. The only really interesting dish was our appetizer, a set of pressed pork discs (I thought that they bore a intriguing resemblance to communion wafers) served with tangy raw garlic and soy sauce. The main course, a veal shank, was curious; it was brought out whole, wrapped in tin foil, and then cut into appropriately-sized chunks at the table by the waiter. The curious thing is that in Chinese cooking, meat is almost never cooked whole like that; despite the soy sauce, the entire thing felt far more French than Chinese. The next dish was where the whole thing fell apart. On paper, tofu with salted eggs is an intriguing, adventurous combination; on plates, it comes equipped with an near-overpowering fishy smell and, oddly enough, virtually no flavor. And the vegetable plate could have merited mention if we’d been at a Japanese restaurant; however, restraint and subtlety of flavor, virtues in the land of the rising sun, are only handicaps on the western shore of the East China Sea. I suspect that Gourmet’s poor writer, dazzled by the proverbial sizzle, simply didn’t pay any real attention to the proverbial steak. That was almost pretentious enough to pass as real food writing, eh? Yes, I know that “pseudonymously” isn’t really a word. But with such intelligent and erudite readers such as yourself, I needn’t apologize for inventing words that really should exist. 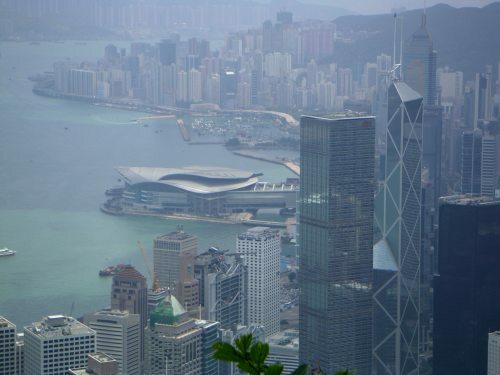 Hong Kong has a 6-day work week. Yup. Six days on, one day off. And, of course, the eight-hour work day is, as far as Hong Kongers are concerned, a mythological beast. One of my favorite American restaurants in Hong Kong, the LA Café, is no longer, having been replaced by a Ruth Chris’ Steak. This makes be sad, because the LA Café used to be one of the very few places one could go to in Hong Kong to watch NFL football (usually on tape delay, but they’d be open at six a.m. on Super Bowl Monday (it’s that darn international dateline) so a hardy (and sometime rowdy) few could watch The Big Game live. Not to mention the fact that they had great Tequila Sunrises. Sigh. Nine’s enough for now. More later.